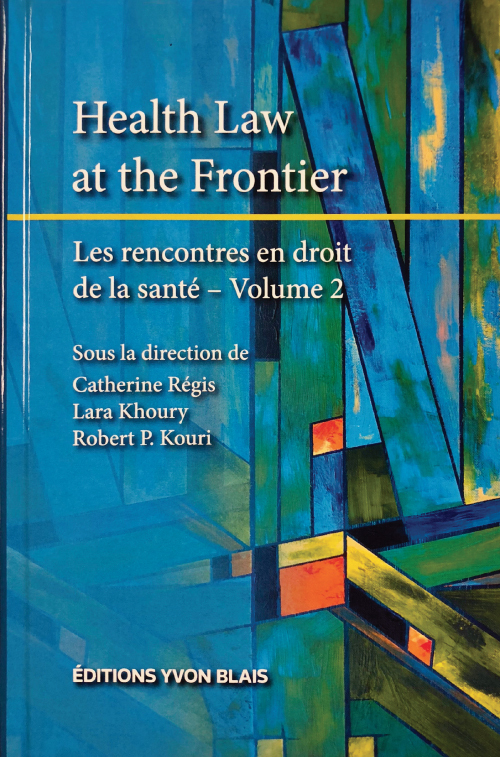 This edited collection is the result of the latest iteration of the Health Law Academic Seminan/Rencontres en droit de la santi, which dealt with the theme « Health Law at the Frontier ». Fourteen national and international scholars were invited to participate in thls event based upon their fields of research and recognized expertise in relation to the theme of the Seminar. ln this book, readers will find a variety of papers exploring different forms of frontiers in health law and pollcy. Frontier is sometimes taken in the geogra­phic sense of the term (globalization of health concerns, protection of health in the context of free trade, access to health care for migrants, etc.). ln other texts, the theme of frontier led to scrutinize innovative approaches to law and health that investigate cutting-edge questions on the periphery of the discipline (big data, the development of information and communication technologies, new issues in liability law, etc.). La direction de cet ouvrage (évalué par les pairs) a été réalisée par les professeurs Catherine Régis, Lara Khoury et Robert P. Kouri. Pour vous procurer cet ouvrage, consultez ce site. Ce contenu a été mis à jour le 7 juin 2018 à 16 h 36 min.